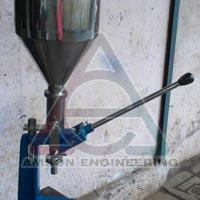 We, as a prominent Manufacturer, Exporter & Supplier, bring forth Manual Paste Filling Machine. It is manufactured using first-class raw material ensuring its durability and longer service life. Our team of experienced professional takes care of the designing and fabrication. We leave no stone unturned to ensure that our machine matches the various parameters and standards set by the industry. It is available in different customized specifications as per the request of the customer at economical rates. 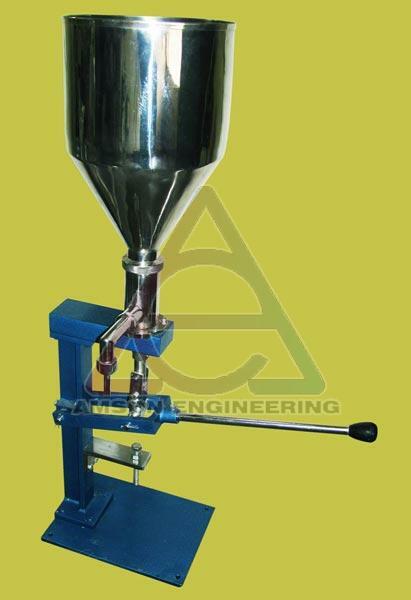 This is the basic and proved machine for paste or cream filling applications. Very widely used and famous among small and medium production industry. 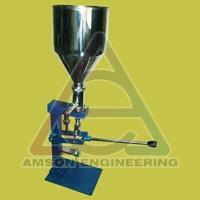 Hand Operated Paste Filling Machine is very economical, easy to operate and easy to maintain type. Any semi-liquids and pasty materials, like cream, pastes, gel, ketchup, and other same kind materials can be easily filled accurately by using this machine. Machine base and main structure is made from fabricated mild steel which is machined and duly powder coated to get the finish. There are parts like hopper and operating lever, fill barrel, nozzle, and adjustment screw are present in all machines. Fill Barrel is another main part in this machine. This is also made from Stainless steel. The inside of each barrel is ground to get mirror finish. Barrel design is done as per fill volume requirements. The barrels are available in 15gms, 25gms, 50gms, 100gms, 150gms, 200gms, and also 500gms. The piston is a specially designed one, which does suction and filling in one stroke. Fill nozzles are welded to the barrel. The mouth of nozzle is maintained towards down to fill smoothly into containers or tubes below the fill barrel. 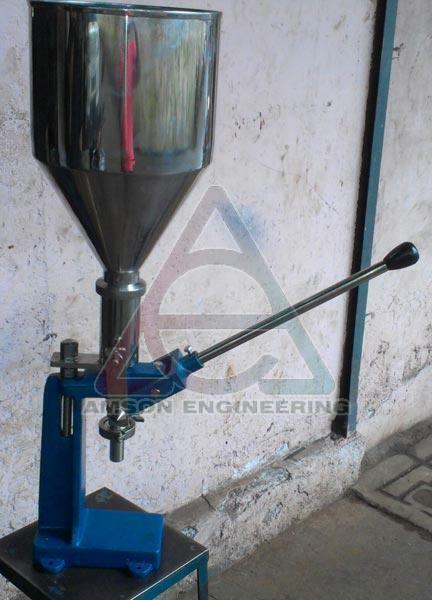 Machine Model - AEHPF200, Steady Hopper type. Machine weight - 35 kgs. Gross weight - 55 Kgs. Fill capacity - up to 15 fills per minute as per operator skill. Hopper capacity - 22 Liters.